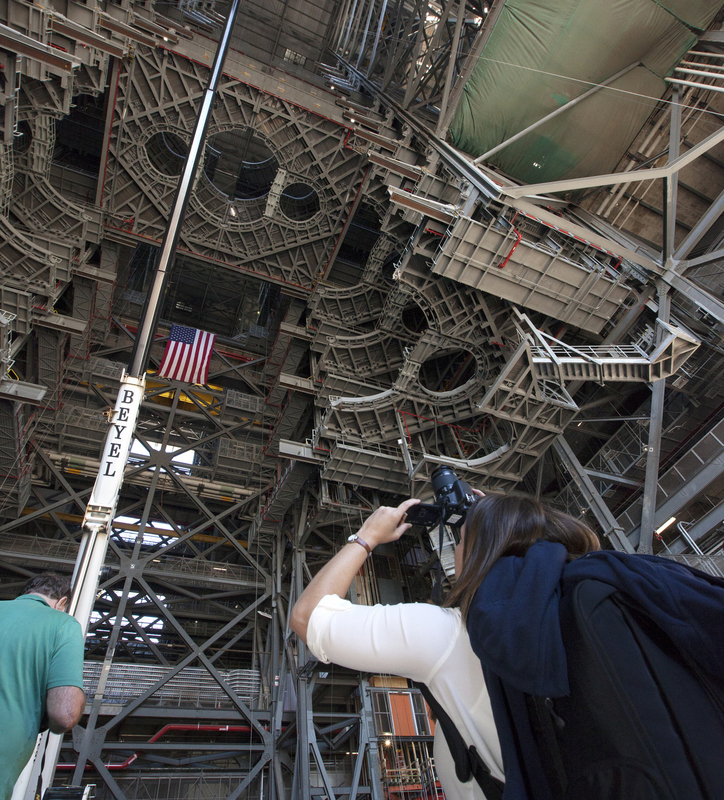 Members of the news media recently viewed the ten levels of new work platforms inside High Bay 3 of the Vehicle Assembly Building at NASA’s Kennedy Space Center in Florida. Work to install the platforms came to conclusion Jan. 12 as the final work platform, A north, was lifted, installed and secured on its rail beam on the north wall of the high bay inside the iconic facility. Twenty platform halves will surround NASA’s Space Launch System (SLS) rocket and the Orion spacecraft atop the mobile launcher and allow access during processing for missions, including the first flight test of Orion atop the SLS. With the goal of being a multi-user facility, the new platforms were designed to be adjusted up and down, and in and out on their rail beams in order to accommodate the SLS and its solid rocket boosters, as well as other vehicles. Design of the new platforms began in 2010. NASA awarded a contract to modify High Bay 3 to the Hensel Phelps Construction Co. of Greeley, Colorado, in March 2014. Hundreds of NASA and contractor workers were involved in the design, manufacture and installation of the platforms. The platform levels are A, B, C, D, E, F, G, H, J and K. With the K-level being the lowest and the A-level the highest platforms. The mobile launcher will be rolled into High Bay 3 in the fall for multi-element verification and validation testing with the platforms.